The Navy calls its enlisted jobs ratings. Similar ratings are placed into groups known as communities. For example, ratings that are administrative in nature, are placed in the Administration Community. Ratings that deal with aircraft are placed in the Aviation Community. The Navy Ratings are what other services call Military Occupational Specialties (MOS). Here's an overview of the Navy job communities and some of the ratings contained within each. LN - Legalmen (Paralegals) provide legal assistance to fellow sailors in a variety of areas, and prepare records for such proceedings as courts-martial and courts of inquiry, and assist personnel in filing claims, and conducting their investigations. 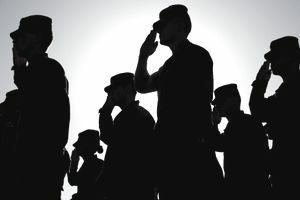 NC - Navy Counselor is a position not open to entry-level enlisted personnel since it requires a thorough understanding of the Navy and how it works. In this rating, among other duties, sailors will interview personnel, prepare and deliver talks, establish and maintain liaison with local media and recruit civilian personnel into the Navy. PS - Personnel Specialists are like the human resources coordinators for the Navy, providing enlisted personnel with information and counseling about Navy occupations, education and job training, requirements for promotion, and rights and benefits. YN - Yeomen (Administration) are responsible for a variety of personnel administration tasks, such as maintaining records and official publications, and performing administrative functions for legal proceedings, such as preparing briefs and other documentation. It takes many specialties to make the Aviation Community in the Navy operate smoothly. These ratings cover a wide variety of responsibilities and include aviation mechanics, supply and logistics and air traffic control. AC - Air Traffic Controllers, like their civilian counterparts, are responsible for directing and controlling the movement of Navy aircraft and instruct pilots via radio communications. AD - Aviation Machinist's Mates are aircraft mechanics, who perform necessary maintenance, repairs, and updates to Navy aircraft. AE - Aviation Electrician's Mates have tech and electronics expertise and provide repairs and updates to aircraft as well as performing in-flight duties such as operating radar and weapons systems. AG - Trained in meteorology and oceanography, an Aerographer's Mate (Weather and Oceanography) measure and monitor conditions such as air pressure, humidity and wind speed, and then distribute the information to aircraft, ships, and shore facilities. AO - Aviation Ordnancemen handle and service weapons and ammunition carried on Navy aircraft. AT - Aviation Electronics Technicians repair and maintain navigation, infrared detection, radar, and other complex electronics systems. These sailors are responsible for receiving, decoding, and analyzing intelligence from foreign nations electronic communications (radio, internet, written, spoken, email and other varieties). Most of the CT ratings are Cryptologic Technicians, with specializations for interpretation, maintenance, networks (maintaining and monitoring the Navy's tech infrastructure), collection and technical. IT - Information System Technicians have duties similar to a civilian IT person, operating and maintaining the Navy's satellite telecommunications systems, mainframe computers, local and wide area networks, and micro-computer systems. The Office of Naval Intelligence is responsible for the collection, analysis, and production of scientific, technical, geopolitical, military and maritime intelligence. The Intelligence Community is made up of more than 3,000 military, civilian, reservists and contractor personnel at locations around the world. This rating includes IS - Intelligence Specialists, who analyze intelligence data, prepare and present intelligence briefings, use maps and charts to produce image data and maintain intelligence databases. The Medical and Dental Communities of the Navy are part of the big medical care machine known as the Navy Bureau of Medicine. All the specialties of the medical and dental communities branch off from the Hospital Corpsman rating. You can pursue dental, neurology, cardiology, surgical, combat or special operations medics to name a few specialties available to the Navy Hospital Corpsman (HM). Ratings in the nuclear field are highly competitive. Applicants need to be well-qualified in math and science since they'll basically be operating nuclear reactors. The submarine force and aircraft carriers run solely on nuclear power and propulsion. There are three ratings in the Nuclear Field (NF): Machinist’s Mate (MM), Electrician’s Mate (EM), and Electronics Technician (ET). The rating in which an NF candidate is trained is determined at boot camp. Nuclear-trained MMs, EMs, and ETs perform duties in nuclear propulsion plants operating reactor control, propulsion and power generation systems. The NF will work closely with specialists in the nuclear, technology, and engineering fields. In addition to being the builders (the name SEABEE comes from the abbreviation "CB" for "Construction Brigade) of the Navy, construction workers and engineers are trained in combat tactics, maneuvering and defense of their positions. BU - Builders work as carpenters, plasterers, roofers, concrete finishers, masons, painters, bricklayers and cabinet makers. CE - Construction Electricians build, maintain and operate power production facilities and electrical distribution systems at Navy installations. CM - Construction Mechanics repair and maintain a variety of heavy construction and automotive equipment including buses, dump trucks, bulldozers, and tactical vehicles. EA - Engineering Aides are like the foremen of the Navy, conducting land surveys, preparing maps and sketches for construction sites, and estimating costs for building projects. Military Police and the Naval Master at Arms rates keep the bases and forward operating bases safe from harm by setting up security procedures, controlling access, enforcing existing laws, and deploying defensive tactics when needed. Duties of the MA - Master at Arms range from conducting security patrols and law enforcement operations to operating brigs and providing protection for high-ranking dignitaries and government officials. Navy Special Warfare and Special Operations Community operate in small teams performing intricate missions, from salvage operations, IED (improvised explosive device) disposal, hostage rescue, and small boat operations. EOD - Explosives and Ordnance Disposal Technicians do just what the rating's name suggests, and dispose of all types of explosives and ordnance. They're often called upon to assist civilian law enforcement with disposal efforts. ​ND - Navy Divers spend a lot of time underwater, doing underwater salvage, repair and maintenance on ships, submarine rescue and in support of explosive ordnance disposal. SO - Special Warfare Operator (Navy SEALs) are an elite fighting team in the Navy, organized, trained and equipped to conduct special operations and missions. Nuclear-powered submarines have some of the most highly skilled workers in the Navy. There is a wide range of ratings specific to the submarine community, including Culinary Specialists CS(SS) who make the meals, to Storekeepers SK(SS) who maintain an inventory of repair parts and other supplies. And YN(SS) - Yeoman (Submarine), who handle clerical and other related work aboard the submarine. There are a wide variety of ratings within the surface combat community. BM - Boatswain's Mates direct and supervise ship's maintenance duties in the upkeep of ship's external structure, rigging, deck equipment, and boats. This all-purpose position is tasked with a lot of varied duties, including standing as helmsmen and lookouts or as security watches. They may also serve as part of a damage control, emergency or security alert team. GM - Gunner's Mates, the oldest rating in the Navy, are responsible for guided missile launching systems, gun mounts and other ordnance equipment, including small arms and magazines. MN - At sea, Minemen work aboard minesweeping ships to find and neutralize underwater mines. If they're ashore, they're technicians who test, assemble and maintain underwater explosive devices. QM - Quartermasters are navigation experts, standing watch as assistants to officers of the deck and the navigator. They also serve as helmsman and perform ship control, navigation and bridge watch duties. EM - Electricians Mates are responsible for the operation of a ship's electrical power generation systems, lighting systems, electrical equipment, and electrical appliances. HT - Hull Maintenance Technicians are responsible for the upkeep and repair of ships' structures. They maintain shipboard plumbing and marine sanitation systems and repair small boats, among other duties.